With Team Fortress 2 being a serious e-sports game, it was really hard to locate our newest interview victim. Because of all the latest premiership drama, HYS went into hiding, trying his best to avoid e-paparazzi. Even the mighty Epsilon family only issued official press releases, refusing to answer any questions regarding their latest roster drama. Thankfully, a good tip from a certain Latvian freelancer gave us a lead where HYS currently resides. We found him in a rented penthouse, sitting on a enormous black couch, drinking champagne with dozens of unopened contract letters from gaming organisations around him. Bodyguards stopped punching me once HYS heard I was a Slavic brother. RD: Before we start with the big questions, can you let us know what HYS stands for? Google suggests Helsingin Ylioppilas Salamurhaajat (Finnish: Student Union of Helsinki Assassins), but I have a feeling it’s something a bit more relaxed than that..
RD: Damn it, I was hoping that you really were a Helsinki Assassin. That would definitely shed some light on your shoulder injury at the beginning of the last season. Did you punch your keyboard Darn style, or was it a more conventional injury? H: Nah, did it in the gym trying to bench too much. RD: Now that you’ve solved those mysteries for us, let us talk about another, bigger one – your departure from Epsilon. Everybody has been tearing apart their keyboards; what happened? The lack of information is killing people, HYS! Judging by a few apologies coming from Knoxx in a VanillaTF2 thread, it seems it wasn’t (fully) his decision to remove you from the roster. What happened with the team? What was your reaction when they told you? H: There were a couple of bad results against BFF, and the team felt I was underperforming. I just said “Okay, that’s fine and good luck”. Simple as that. The words on Vanilla were for one of my closest friends only, and he decided he would share that with the community. RD: You reckon Mike will be a good substitute for you? Judging by chat logs between Mirelin and yourself, it seems other players seem to be part of the problem too. H: Mike is the best deathmatcher in the game so he can easily provide more damage, but I don’t think he will make as much of an impact on demo as he does from pocket, especially if enemy teams put him under a lot of pressure. I don’t really wish to discuss what the issues with Epsilon are, but they made a lot of changes and you cannot expect that to work overnight. RD: Maybe I am not as informed or experienced as active premiership players, but I’ve never seen Epsilon being unstable like this. It even seems the lost games against BFF and roster issues brought down the team’s morale and “synergie” as KnOxXx put it. Hopefully no one will mind if I am being cocky, but is Epsilon panicking? H: I don’t think they are panicking. I think they were with the same lineup for 2 years, and at the time they formed, the community was a little broken up. They also made a lot of changes to the lineup, with KnOxXx moving from medic, Mike from pocket to roamer, and they are missing Numlocked and Schocky. I think Schocky is a big loss because of his partnership with Bash. Epsilon have had to experiment between Kiler4fun and Bash from pocket scout and roam, and Kiler is maybe not on his best position right now, so there is a lot of disruption and some players expect to see results instantly, which simply just will not happen. RD: Enough about Epsilon. I have been informed that you are not wasting time, and that a new team is in creation. Apparently, you want to contest TOP 4 teams. Can you tell us any details about that? Will it be a team of young potentials or premiership veterans? I heard there are a lot of bored premiership players in this season’s division 2B. RD: Can we expect a new The Last Resort team in terms of sponsorship? RD: You are not really vocal on the ETF2L forums, so the next question asks for some of your feedback about the ETF2L map pool. The community is divided when it comes to Capture The Flag mode in TF2, but you’ve been playing the game at top level for ages, thus experiencing Turbine numerous times. How do you comment admin decision to change Metalworks for Turbine? Any other maps you would like to see returned/implemented in the next season? H: I am not a big fan of turbine or viaduct personally. People simply do not want to play these maps even in PCWs. For example, I believe Gravelpit is a good map, but people do not like to play it in PCWs, and for that reason alone, I do not see any reason to include them in the map pool. I didn’t think Metalworks was a great map, but it certainly wasn’t that bad either. Personally I don’t know why we need to add a map for the sake of it. I would be happy to see Badlands, Gully, Process, Snake as the pool, then use the cup system to test new maps. 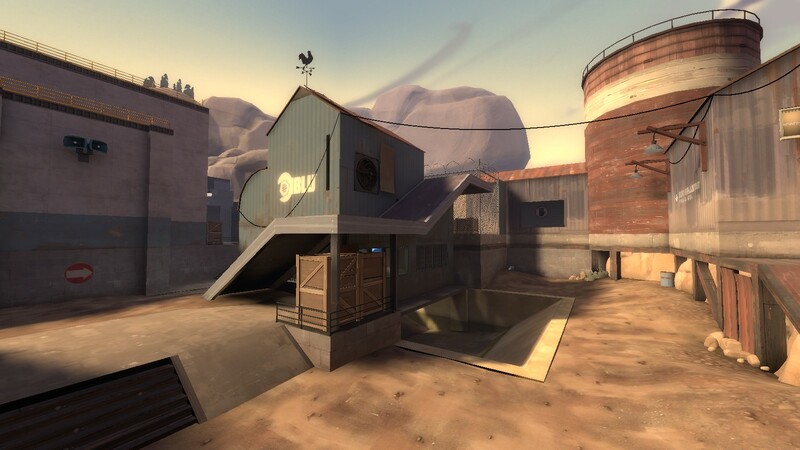 Personally, I would welcome back maps like Freight and Obscure with open arms, just for variety, and they still offer continuity in sticking to control point maps. That is just my opinion, but I am sure many will have a totally different view. It is impossible to keep everyone happy. cp_bazillion, the best control point map ever made. Misunderstood, but not forgotten. RD: Well, too late now! After map pool changes, the unlocks whitelist is the second thing that can melt the brains of the ETF2L community. Sometimes people literally insult each other on the forums when it comes to unlock discussion. As it is already quite clear that ETF2L is trying to unify unlocks with NA TF2 leagues (ESEA, CEVO), there are more and more allowed items in 6v6. Where do you position unlocks in your gaming career? Close to choke where you can fully embrace them, or on trash where they deserve to be? H: A couple of summers ago at i46 I was very much anti-unlocks and how vanilla is the way to go, but I have kinda done a full swing. They offer a little more flavour to the game and allow for some interesting changes to the meta game. I would not like to see the North American structure in terms of maps (I think they play one map in two halves), but I am all for the unlocks, assuming they are added sensibly. I do not think an “allow all, then disallow” is the right approach. I prefer a more measured approach personally. RD: Recently you swapped the TF2 rollouts with casting for TFTV. What made you decide to jump into casting? Can we expect more casts in the future? H: Just trying to give something back I guess. I have taken a lot away from this community, good and bad :D So just wanted to contribute a little. I guess a lot often it depends on whether I am playing with a team or not. I do not have as much free time these days. RD: Finally, a quick question – Will you come to the summer LAN? RD: In the second part of this interview, I’m going to ask you a series of questions originally made by Bernard Pivot, with the final goal of finding something personal about you, without interfering with your privacy. Prejudice – judging someone before you know them. The noise a coin will make against a surface after you have spun it and it is about to come to a stop. Anything that involves DIY, like decorating. Right after the last question, bodyguards started tossing me out of the penthouse. I managed to pronounce one last word between the punches, *shoutouts*. H: Shoutout to Mont, the guy who showed me the ropes in TF2! And just like that, I was smiling on the street because I got a great interview, and I managed to put the TC sponsorship letter on the top of the pile. Nice work. Big drama for i52 plz!